So for 4th of July, I went over to my cousins and we had 3 different types of protein: turkey, salmon, and chicken. Combine the green onions, orange juice, soy sauce, and ground turkey breast. Divide the combine mixture into 4 equal portions of a 3/4-inch-thick patty. Place patties on grill rack coated with cooking spray; grill 6 minutes on each side or until done. We did it just on the stove top and it was fine. Assemble your buns, toast them if you want to. Spread your sauce (you can make the special sauce here). I just simply used a ½ tablespoon of mayo on top half of bun. Add your patty and place a slice of tomato on top. I like my burgers simple. You can go to town on the toppings but I thought this was great as is with just the tomato and slightest bit of mayo. It was so juicy and I really enjoyed the Alvarado Street Bakery brand of sprouted burger buns I purchased at Stop & Shop. The salmon burger is similarly prepared. 1. Cut three-quarters of the salmon into 1/4-inch pieces. 2. Cut the rest of the salmon into chunks and add the mustard, mayonnaise, lemon juice, and lemon zest into food processor. Pulse to make a paste. 3. Add the salmon paste mixture with the diced salmon. Add the green onion, breadcrumbs, 1/2 teaspoon salt, and black pepper to taste. Gently mix until just combined. 4. Divide the salmon mixture into 4 patties. Wrap with plastic wrap and refrigerate for at least 30 minutes. 5. After refrigerating, press both sides of the salmon patties in the breadcrumbs. Add olive oil to the pan and cook the burger to your desired doneness. You don’t want to have overcooked salmon so about 3 to 4 minutes a side on medium heat should be ok.
6. Assemble your buns, toast them if you want to. 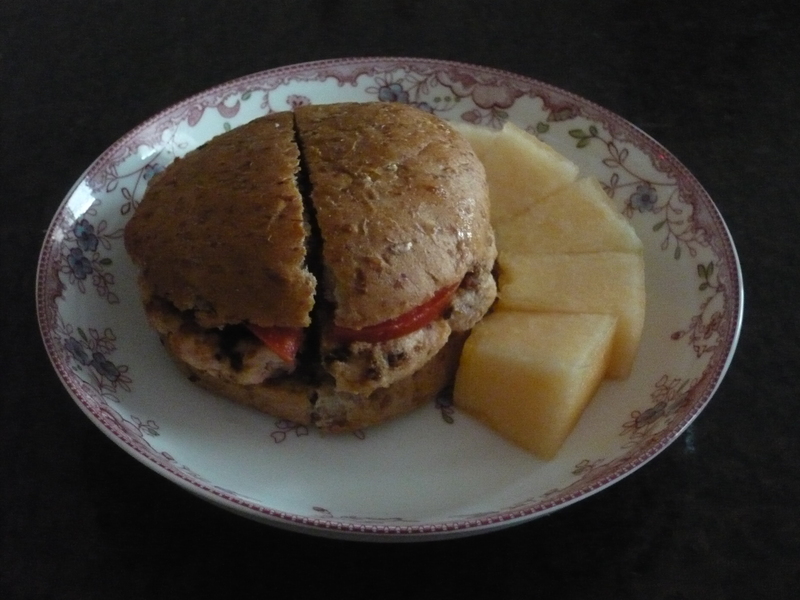 For the salmon burger, I made a simple homemade teriyaki sauce and again had the patty with a tomato slice. This was great too and as I’m trying to eat more salmon, I like having them in different ways instead of just a cooked filet. 1. 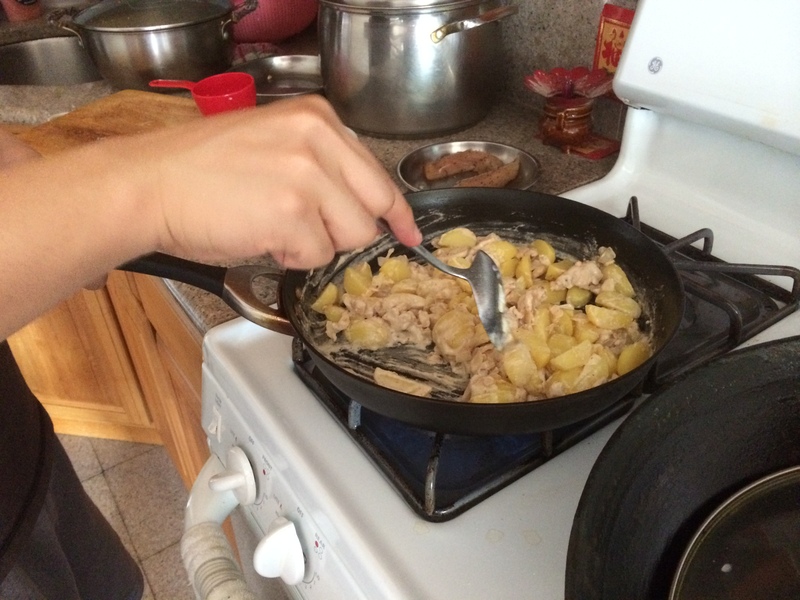 Cook the chicken and potatoes in the oil until almost completely cooked through. 2. 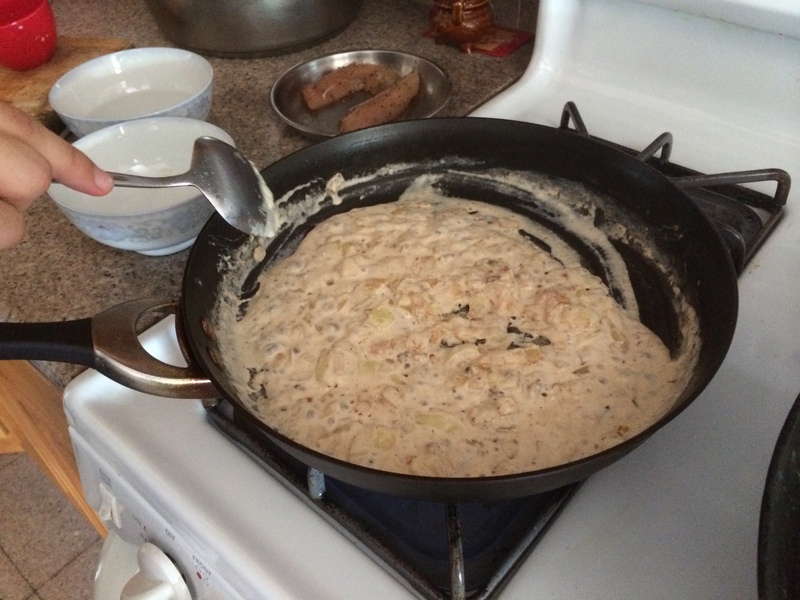 In separate pan, cook the onions in the butter on medium heat until tender. 2. Put in the flour and salt. 3. Stir in the half and half slowly until it thickens. 4. 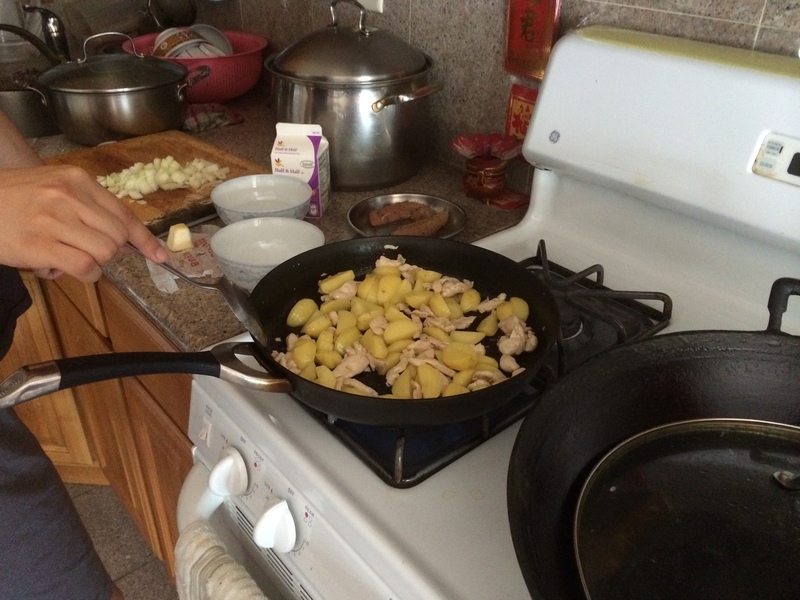 Put in the chicken and potatoes and cover the pan, let it simmer on low heat for about 10 minutes. 5. 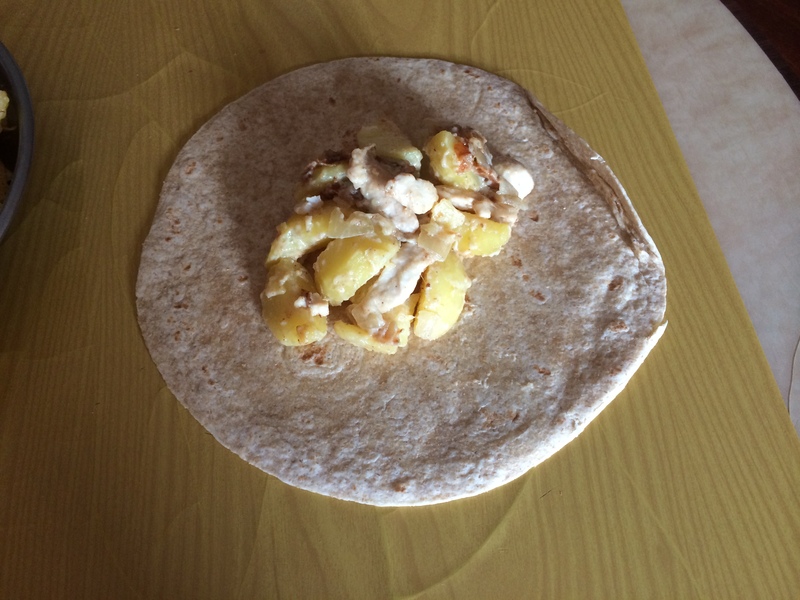 Assemble the cooked mixture in your wraps and enjoy. I like this, it was pretty good as a wrap. It would probably work well over a bowl of rice too. My uncle thought we should have made it as a curry though. Out of the three, I enjoyed the turkey burger (because I love burgers!) the most. 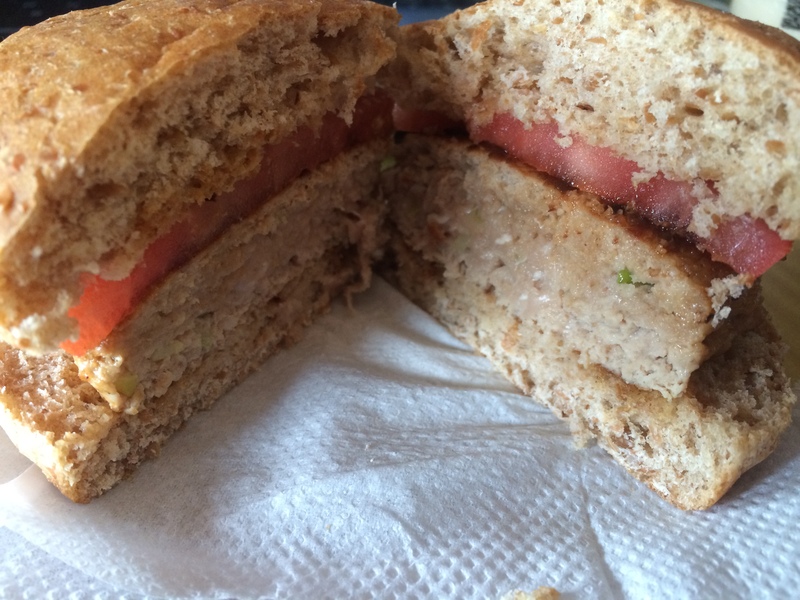 It was juicy and flavorful and I think ground turkey works better as burgers than salmon. Have a must try burger recipe? Please let me know in the comments! The orange juice and soy sauce is just for a bit of flavor and I believe they kept the burger juicy.